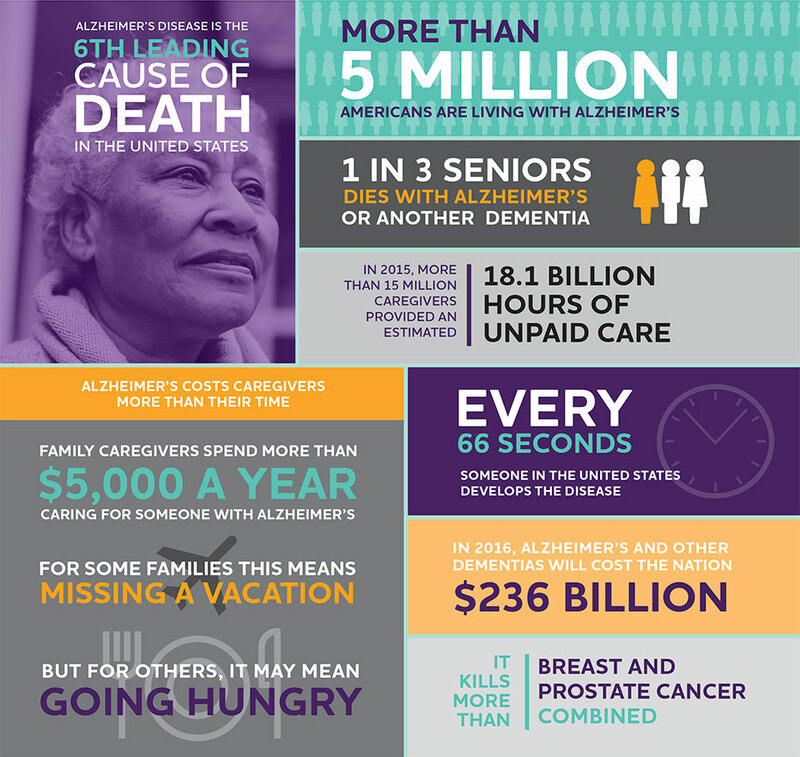 June is national Alzheimer’s awareness month. We put together some basic facts to help educate you on this horrible disease. Alzheimer’s is the most common form of dementia, a general term for memory loss and other intellectual abilities severe enough to interfere with daily life. Alzheimer’s disease accounts for 60 to 80 percent of dementia cases. Alzheimer’s worsens over time. Alzheimer’s is a progressive disease, where dementia symptoms gradually worsen over many years. In its early stages, memory loss is mild, but with late-stage Alzheimer’s, individuals lose the ability to carry on a conversation and respond to their environment. 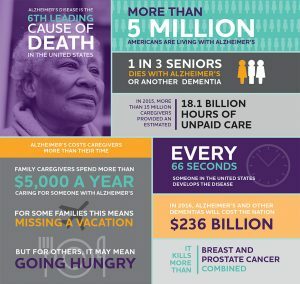 Alzheimer’s is the sixth-leading cause of death in the United States. Alzheimer’s has no current cure, but treatments for symptoms are available, and research continues. place; unfounded suspicions about family, friends and professional caregivers; more serious memory loss and behavior changes; and difficulty speaking, swallowing and walking. People with memory loss or other possible signs of Alzheimer’s may find it hard to recognize they have a problem. Signs of dementia may be more evident to family members or friends. Anyone experiencing dementia-like symptoms should see a doctor as soon as possible.